First Line: The county that stretches from Melbourne in the south to Sydney seven hundred and fifty miles up the coast is green with trees and paddocks. "It seems fitting to dedicate this book to an Australian soldier I met at a bar many years ago in Sydney. All I can remember about him was that he had a bad bayonet scar from service in Malaya and that he got me hopelessly lost on the New South Wales rail system before he passed out." 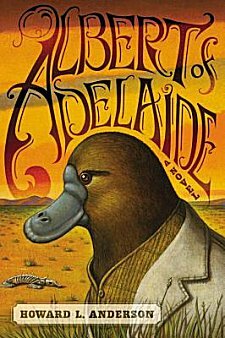 Albert is a platypus who was orphaned and brought to the Adelaide Zoo at a very young age. He's grown up remembering his childhood and listening to the tales of other zoo inhabitants about the "Old Australia," a place far away in the desert where nothing's changed since the beginning-- a place that's filled with freedom and peace for all animals. Tired of being stared at, laughed at, and called names, Albert begins hoarding grubs and filling a discarded soda bottle with water. One day someone's careless, and Albert makes his break for freedom, riding the rails as far as he can, until he finds himself lost in the desert. Undaunted, Albert trudges on, holding on to his dream of a place where he belongs. What he finds is a bit more than he expected (and the reader, too, for that matter). Jack the wombat saves Albert, and it's not until they spend the night drinking and gambling in the mining town of Ponsby Station that Albert learns Jack is just a little too fond of matches. Accused of burning down the mercantile, the two run for their lives and split up as they enter dingo territory. Albert goes on to make the acquaintance of a pair of drunken bandicoots, a militia of kangaroos, packs of dingoes, a former prize-fighting Tasmanian devil, and a raccoon straight off the boat from California. Every step of the way, Albert discovers that his "road less traveled" and the companions he finds are actually putting him on the path to finding out who he truly is. I was entranced by this book. When I met the author in July, he said that the genesis of Albert of Adelaide began more than twenty years ago when he began telling bedtime stories to his then-girlfriend's five-year-old daughter. He didn't want these bedtime stories to be run-of-the-mill stuff, and I would've loved to have listened in. As it is, I fell in love with Albert, his journey, and the friends that he made. I don't listen to audio books, but I think that it would be the perfect format for this book. You're never too old-- or too young-- to hear Albert's story of adventure, friendship and self-realization. Oh yay! I've got this on audio! That should be absolutely perfect, Kathy!!! I saw the title and thought, ah, historical fiction! Was I wrong. Looks like a very cute book. It's more than cute, Harvee!